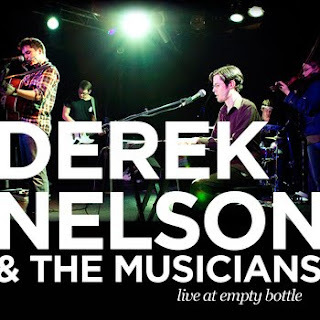 The very talented Derek Nelson (whose debut EP, Something Obscure, we previously reviewed here) has just released a FREE digital live EP recorded from his January 13 show at the Empty Bottle. The EP is made up of six tracks, including three previously unreleased originals, a spirited take on Bob Dylan's "Walkin' Down the Line" and two from the debut. Anyone into Americana, folk-rock and the like would be wise to grab it here. Derek also has a band now, simply called "The Musicians," and the group will play their third show together this Thursday, February 4, headlining Lincoln Hall ($10, 9 p.m., 18 and over). The show will be presented by Loop Apparel, who will commemorate their closing by giving away free t-shirts to everyone who enters. The bill also features two other Chicago acts - Daysleeper, who will be releasing a record, and Overman. Click here for tickets and more information.